After a busy summer writing up my music and myth project and doing the final proofing and indexing for my book on music at the Elizabethan court, I have recently started a new job as the research assistant for the Tudor Partbooks project. 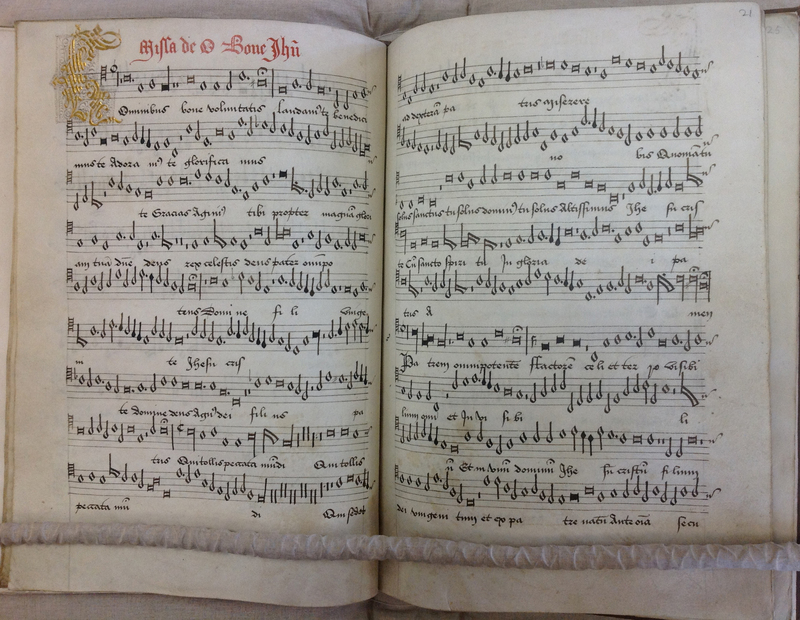 This three-year, AHRC-funded project led by Magnus Williamson and Julia Craig-McFeely aims to digitize all the extant manuscripts of Tudor polyphonic music c.1510-1580 preserved in partbook format (where each vocal part is written in a separate book). These will be made publicly available via the DIAMM website. The Baldwin partbooks require a different process of restoration. This is a set with one book missing (the tenor), rendering all their music incomplete.While some of the music can be found in other sources, about sixty pieces are found nowhere else. A process of collaborative reconstruction drawing on the expertise of both scholars and performers will create a plausible version of the missing parts, allowing these works to be performed and developing a greater stylistic understanding of the repertory in the process. The research team will also be undertaking a detailed scholarly investigation of these sources, looking for connections in how they were copied, their notational styles and practices, their format, their contents,and the contexts in which they were written and used. In particular, although these partbooks post-date the Reformation, they are the dominant sources for much English church music from earlier in the century. We’ll be looking at the extent to which these sources preserve pre-Reformation practices, or make adaptations to suit later (and non-liturgical) use. Music Faculty, The University of Oxford. Saturday 7th March, 7:30pm: In the Midst of Life: Music from the Baldwin Partbooks – a concert by Contrapunctus, directed by Owen Rees.